Normally, phones with the new and trendy 18:9 screen aspect ratio for a near bezel-less and full view effect are only found on mid-range and high-end models. Recently, local brands like Cloudfone and Cherry Mobile has released really affordable smartphones with that type of tall full view screens. Today, we spotted a news stating that TCL will join the party! The company will soon reveal the Alcatel 3C, a budget-friendly smartphone with 18:9 screen aspect ratio. Specs-wise, the handset will feature a 6-inch HD+ 1440 x 720 screen at 269 ppi. 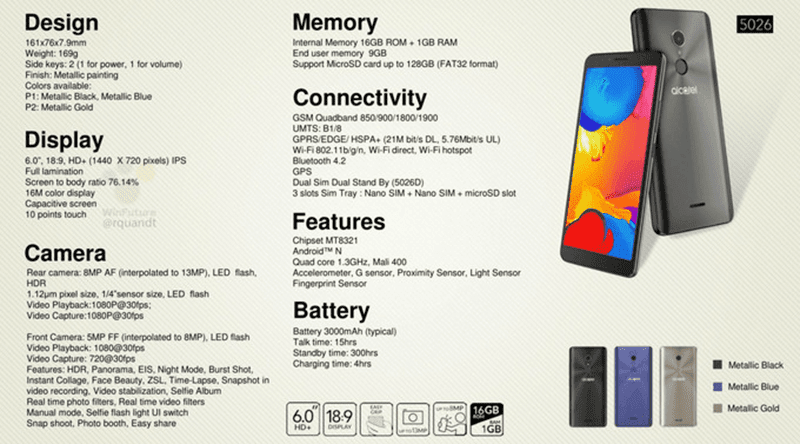 Inside, it'll only have a quad-core MediaTek MT8321 processor clocked at 1.3GHz. The phone will also have 1GB RAM, 16GB expandable storage up to 128GB, 3,000mAh battery, 8MP main camera, and 5MP selfie camera. According to leaks, the Alcatel 3C in metallic black, metallic, blue, and metallic gold will sell in Europe for no more than 120 Euros (around PHP 7K).